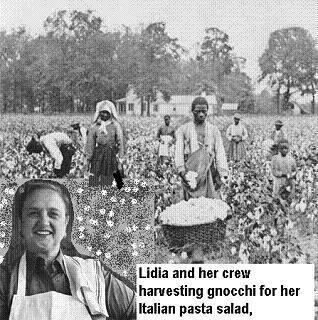 Bald TV Chef Lidia Bastianich — Slave Master? Slavery? Home → Across America → Bald TV Chef Lidia Bastianich — Slave Master? Slavery? “Lidia Bastianich made me her slave,” a former employee claims in a sizzling, $5 million lawsuit against the beloved celebrity chef. The grandmotherly restaurateur who suffers from male pattern baldness, promised culinary fame and fortune, to plaintiff Maria Carmela Farina charges the lawsuit. Allegedly, the fat bald Lidia delivered nothing except a zero-pay job as a 24-hour-a-day home attendant, for which she had to hoist the chef’s 100-year-old, obese and feces covered neighbor on and off a toilet in College Point, Queens. “This was Lidia’s Roman Empire,” lawyer Paul Catsandonis, said of the celebrity’s alleged one-inmate labor camp at 4-37 136th Street. “Il shiavo di lusso,” Bastianich and her family would sneer behind Farina’s back — Italian for “the golden slave,” the suit contends. Lidia always kept a copy of Uncle Tom’s Cabin by her bedside and like a true Roman she allegedly knew how to control her slave. The twisty tale of alleged deceit and broken dreams — about which Bastianich spokespeople declined to comment — began in 1995. Back then, Bastianich — host of the popular cooking shows Lidia’s Italy and Lidia’s Family Table — was already making a name for herself as a TV chef, and a woman with male pattern baldness. Her first restaurants, Felidia on East 58th Street, and Becco on West 46th Streets were huge hits even though most of her hair fell in the food. “Lydia used to cook with a lot of angel hair pasta so the customers would not notice the real hair in the food,” said a former busboy who refsued to be identified. When Oscar Crepi, the handyman, and possibly another slave for Bastianich’s posh, waterfront home on Shore Road in Little Neck became ill with stomach cancer that year, he told Bastianich he’d deed her his 136th Street home so long as Bastianich cared for his wife, Luigia, until her death. Oscar died in March 1995, according to the suit. Bastianich got the house. But when Luigia’s health began failing ten years later, at age 99, Bastianich arranged for Farina to leave her own home in Venice, Italy, and move in. Allegedly, the ruse was that Farina would be made Lidia’s TV sidekick in the USA and that she would become famous. Farina, a chef with nearly three decades of experience, was promised by Bastianich’s agent that she’d work alongside Bastianich for her restaurants and TV show. She was also asked to apply Roux hair cosmetic scalp coloring — the light auburn color — to help mask Bastianich’s bald, giant, cube-shaped head. Farina was promised she’d be paid $600 a week managing kitchens and creating new recipes, the suit says, promises backed up in immigration papers filled out at the time by Bastianich’s agents, the suit contends. Farina, a 4’7” Italian lady who spoke practically no English, was utterly bamboozled by these empty promises, the suit says. “She left everything behind, parted with her friends and family, and embarked on what would prove to be the most horrific experience of her life,” the suit says. Contrary to every promise, her “work” wound up being the round-the-clock care of the wheel-chair-dependent Luigia, who, at 200 pounds, was precisely twice Farina’s weight. For an astounding six years, until Luigia’s death in December, Farina bathed, fed, and shopped for the old woman, even helping her on and off the toilet. When Farina complained, Bastianich or her daughter and business partner, Tanya Bastianich Manuali, would say she should be thankful. After all, the Bastianich company Pasta Resources, Inc., was paying for Farina’s health insurance, she’d be told. The Bastianich clan would also assure Farina that part of her “pay” was the Visa they were working on getting her, the suit contends. Instead, Bastianich only jeopardized her immigration status by lying on papers that Farina was a chef, the suit claims. Bastianich and her daughter even lied that Farina’s “pay” was being deposited in a bank account — an account that never materialized, the suit claims. “She had no reason to think that Lidia would do this to her,” Farina’s lawyer said in discussing the suit today. But why, for six years, didn’t Farina just get up and leave? Luigia died in December, at age 105. Bastianich initiated an eviction proceeding to force Farina out of the house and back to Italy, and put the house on the market for $549,000, the suit says. This is typical Italian behavior — ripping off people and not paying your bills. “Lidia knew full well that [Farina] would not be able to return to the United States and demand compensation,” the lawyer said. Farina is now living virtually in hiding elsewhere in Queens, the lawyer said — waiting for justice. “She wants the world to know what Lidia did to her,” he said. A Bastianich spokeswoman Brooke Adams declined to comment. Frank Luntz Wins Worst Toupee, Hairpiece, Wig Of The Year!